After Napoleon’s 1814 defeat, Europe became open to tourism once again. Italy was the most popular destination, where tourists flocked in pursuit of works of art. Souvenir purchases often included copies of masterpieces and also jewelry in the form of cameos, intaglios, and, most notably, miniature mosaics. A miniature mosaic is a composition of tiny, glass tesserae cut from pieces of glass known as smalti filati. Some tesserae are not glass, but stone. 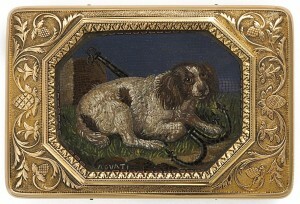 Miniature mosaics are also known as “micromosaics,” a term coined by avid collector Arthur Gilbert. His collection of mosaics, among other treasures, were originally housed at LACMA, but have found a permanent and prominent home in the collection of the Victoria and Albert Museum. Making a micromosaic entailed arranging tesserae in mastic or cement on glass panels with tweezers. Once the composition was complete, the gaps within the arrangement were filled with colored wax and the surface polished. Some of the finest miniature mosaics can have as many as 5,000 tesserae per square inch. 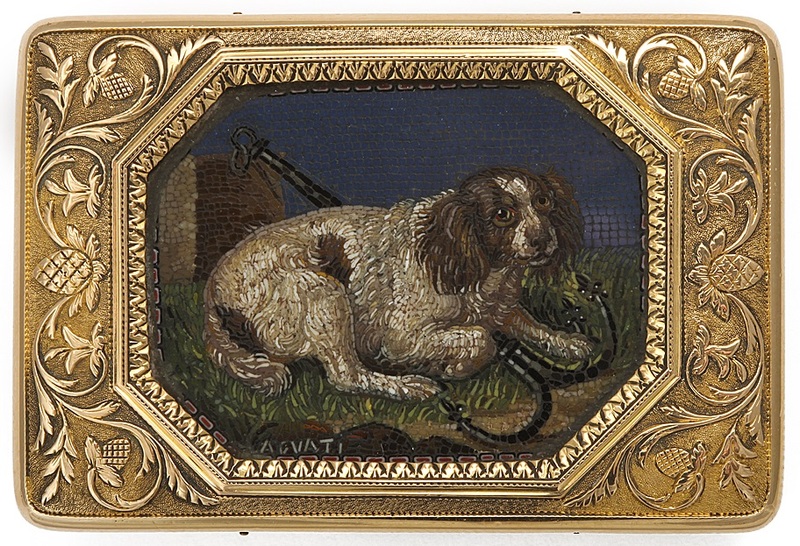 Many micromosaics were purchased as panels and mounted into box lids or jewelry upon a traveler’s return home. 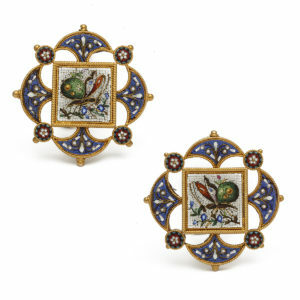 The most popular motifs were the buildings and ruins of Rome, landscapes, animals (mostly birds), and flowers. They ranged in scale, from snuff boxes and jewelry, to large tabletops and replicas of full-sized canvas paintings. In fact, when Arthur Gilbert brought his first micromosaic home to show his wife, Rosalinde, she famously thought it was a cracked painting. Little did she know it was the first of many that would amass one of the world’s finest collections.